The thought police, internalized, stand guard day and night. Yet most of the time, people are not even aware of the cops. It’s only by the outcome that they catch our attention – like an invisible planet with a huge pull, like a black hole that swallows all. It opens up botttled up, buried, undeveloped potential. It opens up feelings – of grief, love, loss, anger. It brings you more to life. And again, like with a gym, the words can’t do it on their own. You have to approach, listen, hear. You have to take time. It stimulates thinking. Loads of good thinking all around at the creativity emporium – it's a gym for the brain. Like any gym, it can’t make people do anything they don’t want to. So some people, at a gym, just see bits of nasty equipment. Others come to love the pleasure of the workouts – and their lives change. And then, the updates - so we don't get lost in our busy lives, so we take a few moments for ourselves, for our inner riches, our inner magic. So many riches within - and so often the riches don't get out. Elsa's Emporium - thinking riches, creative riches, fun riches, deep riches, frivolous riches - from rhinestones to touchstones - each bubbling out to flow into the world. 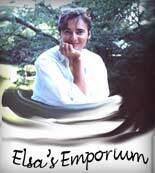 Elsa's Emporium - you never know what you'll find next, but you know ... stimulation, energy, pleasure! Riches on many levels, touching the riches within you, increasing your own inner wealth. Inner magic. Elsa's Emporium - a home wide enough, large enough, with space to breathe deeply, to relax and let the thoughts and feelings flow. Stirring inner fires. Releasing inner riches.